Adah, my quirky, loving, obsessive, sweet & sour (just to name a few) 4 year old currently suffers from a mild case of what I like to call: NO SENSE OF URGENCY. Trying to get her ready to go out somewhere is a chore like no other. She likes to pick out her own outfit, which is fine with me (most of the time) and it usually doesn’t match. I used to fight it, I did, but then I gave it up like chocolate during lent. I don’t actually do that. No one should give up chocolate. Ever. This morning very typically went like this: I asked her to get dressed, bribing with the fact that we were going to her favorite store Harris Teeter (free cookie). I came back 5 minutes later and there were no signs that she made any effort to get dressed. Again I asked and again she did not get dressed but instead, emptied all of her clothing from her drawer onto the floor. HALT! This is where I would like to throw a Mommy Tantrum and lecture her about not doing this AGAIN and that she needs to get dressed NOW. This is not our first make-a-mess-instead-of-get-dressed rodeo. I remained calm, she got dressed, eventually and we were ready to leave. THEN, IT HAPPENED. I remembered I had to empty the litter box because the cat had been crying at me for 10 days (read: 10 minutes) to do it and I also had to run the last rinse cycle on my diapers before we left. The girls were all bundled and ready to go and I made them wait so I could do my things. Did they complain? NOPE. You see, I did not have to be at the store at any specific time, I just wanted to leave and she wasn’t in a hurry to. This is the perfect cause for a Mommy Tantrum which would effect in nothing but negative feelings for everyone. When it was my turn to put a speed bump on our trying to leave no one lectured me, said anything negative to me or even seemed to care that they had to wait. 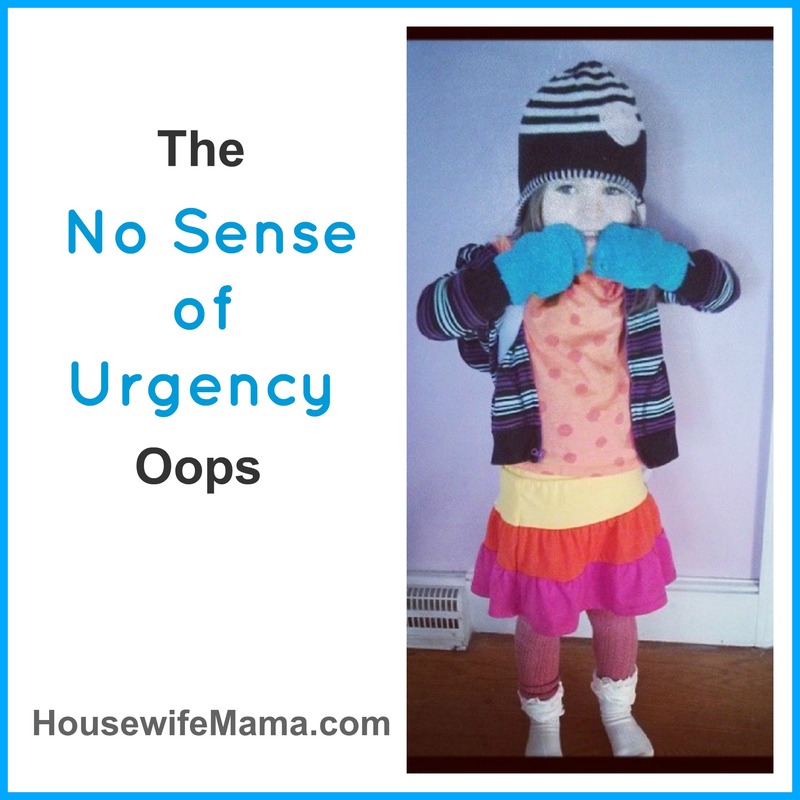 If only I could live life with a mild case of NO SENSE OF URGENCY. I’m not a perfect mom and I am not a perfect Christian. You can usually find me displaying examples if these imperfections every 4-6 minutes. I am a terrible person, I know. It took my 3 year old to bring this to my attention. Have you had a moment like this? Do you have ridiculous words or phrases that are quasi-curse words too?